April 14th, 2012. 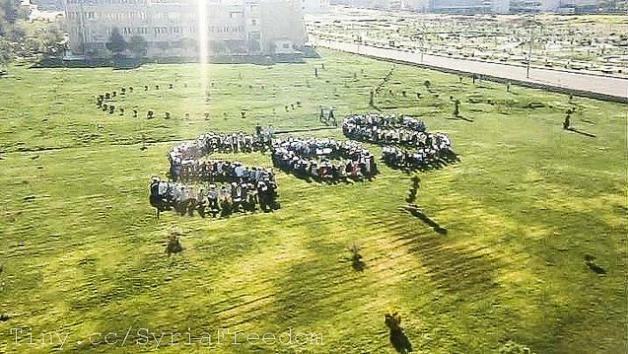 Students At Aleppo University gather to make the universal S.O.S. January 16th, 2013. Students gather for exams just before Assad's jets bomb the University. The Medz Yeghern, the Great Crime, was a holocaust the world has never officially recognized. When dealing with their own "question" of what to do with a large population of "undesirables" the Turks came to a ghastly conclusion. On April 24th, 1915 the Young Turks launched what would become known as the Armenian Genocide. This massive crime would lead to the deaths of somewhere around 1.5 million Armenian victims. And by the time of its completion the Armenian community would be left struggling to survive. Upon the launch of their massacres the Young Turks realized that one of the first targets of their attacks had to be the intellectuals and community leaders of the Armenian society. Attacking these individuals would leave the community at large helpless and make it difficult for Armenians to organize any form of resistance. So on April 14th of 1915 the Young Turks set out across the Ottoman Empire to round up and deport and kill all Armenian intellectuals. 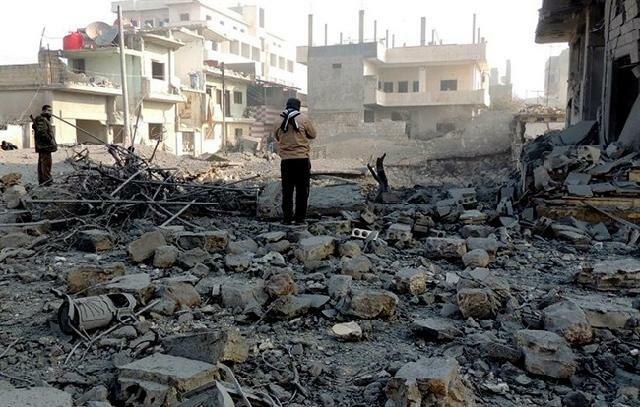 The Syrian regime under Assad has overlooked the usual step of targeting intellectuals up until yesterday. Though there have been round ups of protesters and attempts to kill off those who organize the "opposition forces", Assad had in the past exercised restraint when dealing with the countries academia. So in comparison to the two years of conflict prior yesterdays attack stands out only due to its intended target. It is said far to often in the developed world that the children are our future. It is said that we should view our children as our greatest resource as a nation or society. More poignantly it is remarked that the youth of our nation is our treasure. In this war to maintain power Assad has spent an untold amount of treasure to secure his own future. His barbarism has stripped Syria of most if not all of its resources as the Syrian people go hungry, grow cold in the winter, and die as disease can no longer be prevented. In this war to crush the hearts of his own people, Assad now targets his nation's youth alongside Syria's children. It wasn't long ago that the world watched as the Shabiha (ghosts) slaughtered the children of Homs. It wasn't long ago that we watched as Assad bombed bakeries as the starving waited for a little bread. Now we watch as Assad attempts to stifle discontent amongst those seeking a better life through education. Now we watch as Assad squanders the only resource Syria has left... the only hope of a brighter tomorrow. Obama and the West told Assad recently that there was only one weapon he could not use. They told Assad that there was just one line in the sand that they would not allow him to cross. Without the use of chemical or biological weapons Assad is free to kill the students of Syria. Without the use of tactical nuclear strikes Assad is free to slay the children of his nation. And as long as we don't have to watch it, Assad is allowed to continue to feed upon Syria's innocents like a lion trying to regain control of his pride. Syria will one day be free. Syria will one day be able to hold its head up high without the yolk of Assad's regime around its neck. The only question now is who will lead it? Who will take the Nero of Damascus's place if the educated minds are simply killed off? Who will lead the masses if the youth, a portion of the population driven by more than religion and politics, are driven out of the country? Has Syria not had enough of old world dreams and selfish mens' desires for personal gain? The free world has turned their backs on yet another opportunity to liberate and instead are now helping the extremist gain ground upon fertile soil. Just as they did with Egypt, the world has turned their backs and allowed Syria to descend into darkness. And in the end the neglect of the West will not be forgot when the next regime gains power. The sin of silence has already been committed and if history is any indication the reward is far from sweet. When the Turks finished their genocide the world turned away almost immediately. Armenia, the Assyrians, and the Pontic Greeks were all left to fend for themselves as the Great Powers cut up the maps of Europe, the Middle East, and Africa. Three distinct cultures were left to struggle as the new century seemed to pass them by. The sin of silence has left each culture scarred to this day. Armenians around the world still fight for recognition of their ancestor's suffering. And yet the reward for their struggle remains out of reach. Just as the Young Turks' handiwork lives on almost a hundred years after they have gone, Assad's sins will live for generations to come. Even if the educated, the intellectuals, and community leaders are marched off to firing squads; Assad's sins will never vanish. No matter how many children Assad's regime devours, the next generation will bear these scars. No matter how many mothers and fathers vanish into Assad's black prisons and torture chambers, the Syrians yet to be born will carry on their legacy. Just as the Armenians, Syrians will have to reconcile this travesty for what seems like an eternity. Has Burma Crossed Obama's "Red Line"?